Qualimark is one of the fastest growing company in food processing machinery area. Always in leading to strive new initiatives to continue company’s growth and to remain responsible in the society by doing various activities for societal benefits and upliftment. Read more for all our interesting stories. We at Qualimark believe in “Growing together” policy. It is part of our value system to give back to the society and to take various initiatives to upliftment and development of social area. With this idea we do various initiatives and actions in order to bring Change and development. In order to have combination of work and fun at workplace we keep organizing various activities with an aim for development of new skills, cultivation of new ability and have fun with other co-workers. We do allow school, college and NGOs to visit our company and have fruitful engagements with them. Director Mr. Nimesh Pithava is often invited by various premier institutes to deliver guest lecture at their esteemed institutes. Recently he was invited by Entrepreneurship Development Institute of India (EDII), Gandhinagar to deliver lecture on “Importance of Cost Accounting”. We invite and allow school children to visit our company to have company exposure which can increase their knowledge. Rangoli is one of the most enjoyable art that can be engaged at work place. This activity was organized to explore and encourage creativity amongst the employees and offer them a platform to showcase their skills. Based on Competency “Team Work & Collaboration”, an Inter – Department Rangoli Competition (using sand colours) was organized in October 2017. Being a part of the society and to create the social impact our MD Mr. Naval Pithava and our Director Mr. Sagar Pithava took noble initiative to donate cash gift received from well-wishers in his reception to army rehabilitation fund. Growth is inevitable at Qualimark. It flows in our DNA. In order to continue our growth story and to sustain in this competitive world, we keep doing product development and product promotion activities like launching of new products, participating in various renowned exhibitions and events. Such events help us to remain closure with our valued customers and to have better idea for their problems and expectations which can be act as a base for further design and R&D to develop and upgrade our products in due course. It was great experience interacting with customers and food industry people during Aahar 2018. Khadhya Khurak 2018 exhibition was organized at Gandhinagar. This was our 7th participation in a row. We launched world’s 1stFully automatic Khakhra making machine. We received good response and a great success from the people. They gave overwhelming response in the event. It was proud moment for Qualimark to participate in India’s biggest and largest expo in food industry Aahar 2017 at New Delhi @ 4th time in a row. Qualimark launched world’s smallest Automatic chapati making machine @ Hotel Regenta, Bharuch. To keep our selves updated we keep looking for new ideas and new activities which can benefit the society and help our esteemed employees to remain motivated and to have Qualimark a great place to work. We always strive to take measures to continue our growth story and keep developing our products to improve our product delivery to the customers. 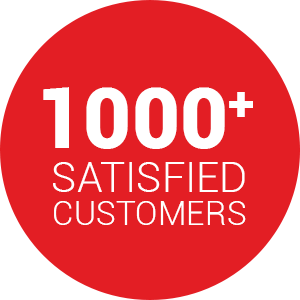 That is what keeps us excited and brings passion towards our work and responsibilities. 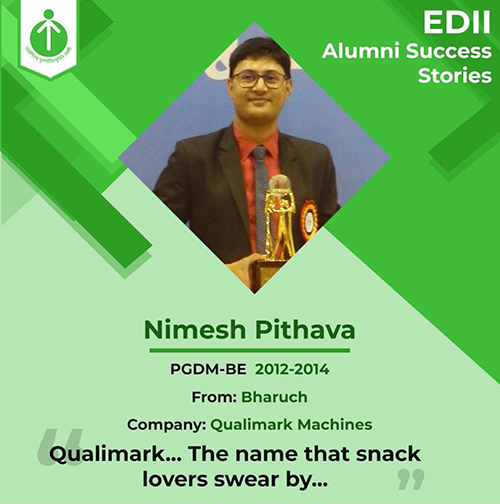 The story of Mr. Nimesh Pithava, Director of Qualimark Machines Pvt. Ltd. got published in EDII Alumni success stories by Entrepreneurship Development Institute Of India. Mr. Nimesh Pithava visited Vimhans Hospital, New Delhi on 15th march 2018 as a chief guest for inauguration of “Automatic chapati making machine” supplied by Qualimark Machines Pvt. ltd. It was indeed an honour for Qualimark to be a part of such social empowerment through our innovative products. story title – “Chief guest visit by Mr. Nimesh Pithava@ Vimhans Hospital”. Will send related picture of the same soon. Our R&D Centre “ReadyPack Foods”. 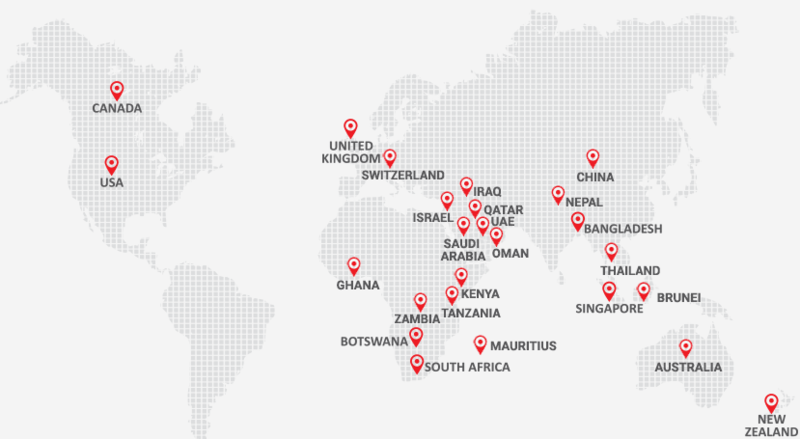 We are happy to announce that Qualimark has started its full fledged R&D centre near at its manufacturing unit. It is the first company to have such research and development centre. This will work as a catalyst in growth of the company and help to bring many more ground breaking innovations in products. Our Regional sales office in Surat, Gujarat. To remain closure to the customers and users, Qualimark opened its first branch office at Surat, Gujarat. This is fully developed and would cater to the south Gujarat territory of the state. With pride and honor; we are proud to share that the internationally renowned publishing company has selected Qualimark Machines Private Limited for writing a learning case study on Qualimark business which will be used as a classroom assignments in Ivy League and management institutions worldwide like EDII and many others. The case was initiated by Professor Dr. Amit Dwivedi who is assistant professor at Entrepreneurship Development Institiute of India (EDII).